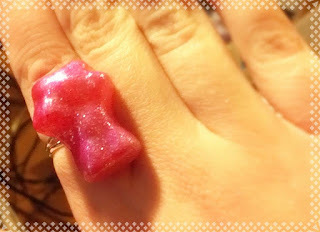 Metallic pink gummy bear ring with glitter! A bigger, bolder gummy bear pendant covered in fine glitter. I found these gummy bears at a local candy shop and had to get some to eat and create with! I made a few different things, but this ring turned out really cute.